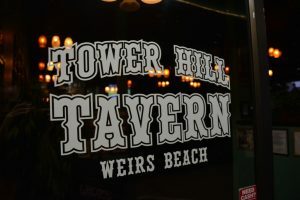 Tower Hill Tavern sits aside beautiful Weirs Beach, which is at the very end of Lake Winnipesaukee. We are an upscale family restaurant and bar with a wide variety of delicious food made with only the freshest ingredients. If you’re at the beach or taking a jog near the water, walk right up to our walk up window and grab a steaming hot slice of pizza. Weirs Beach is the most ideal place to party the way you deserve to party; quiet outside, but loud inside. We host the best live music and live karaoke. Come ready to dance the night away to the most popular current music. Get your photo taken on a red carpet, grab a drink and let your self free. Sing your heart out but don’t break any windows please. Oh, wait, we almost forgot… Motorcycle Week!!! This special event is held every June right in front of us at Weirs Beach. Bike week is the oldest rally in the country and we’re proud to keep it alive and well hydrated. It’s always fun at the Tavern, we look forward to seeing you this summer!